Clemson running back Tavien Feaster (28) and freshman Travis Etienne will now handle kickoff returns for the Tigers. CLEMSON — He knew the questions would begin the second he listed Travis Etienne ahead of Tavien Feaster on Clemson's preseason depth chart. Was Tony Elliott, the Tigers' co-offensive coordinator and running backs coach, sending a message to Feaster to pick it up in practice? 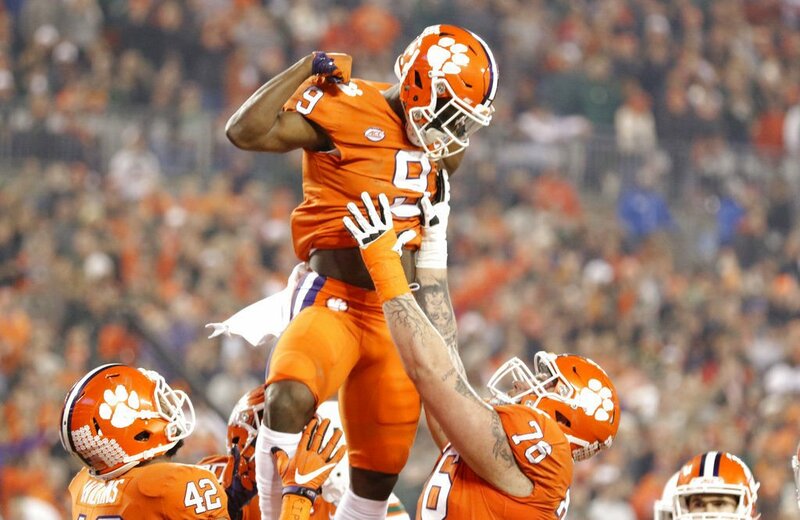 Was Etienne just better in spring workouts? Will both play significant roles this fall? The short answer is that Etienne was more consistent and more explosive in spring ball than any of the other running backs. But it is clear that every rep in fall camp is going to matter before Clemson settles this battle — one that is far from over and one that figures to conclude with the running backs sharing responsibilities, just as they did last season. "Obviously (Travis) is still a young guy, he has some things he has to improve in pass protection, but just like he came in fall camp (a year ago), he was the most explosive guy," Elliott said. "Every time he touched the ball, he was very productive. So we talked about it and we looked at production and his production was above the other two. That's why he's the guy at the top of the list right now (over Feaster and Adam Choice)." Etienne was a surprising enigma for opposing teams in 2017 in that as a freshman, he didn't play every game nor did he ever earn a starting role. But when he did get the ball the in his hands the damage he did came early and often. As Clemson's fourth-stringer to open the 2017 season, Etienne wasn't at a point where coaches could trust him against Auburn in Week 2. The following week was his coming out party, when he broke free down the sideline for an 81-yard touchdown at Louisville. Feaster is more experienced with an extra year under his belt in Clemson's system, but keeping his weight where his coaches want it has proven to be a struggle. "It was tough for him coming out of high school. He hurt his shoulder, so we had to put some weight on him so he could protect himself. (But) when he was a little bit too heavy, he lost a little bit of his explosiveness," Elliott said. "Coming out of the spring, we said, 'Let's try and drop our body weight down to about 215.' He has been carrying that here consistently the last couple of weeks, so the biggest thing is just being consistent every day." With his weight under control, Feaster appears to have more confidence, something Elliott believes will carry over to the field. Feaster has waited two seasons for his breakout moment, but has never completely put the pieces together. He does, however, have the potential to be one of the best running backs in the ACC, and his speed is undeniable. He was a high school state champion in track in the 100- and 200-meter dashes, and still holds the state record in the 200. As far as Dabo Swinney is concerned, Clemson's running back competition will make the Tigers even better. "You're not going to play Feaster and Etienne and Adam Choice? Are you kidding me?" the head coach said. "This is going to be a really special year of running backs." The ACC announced its preseason all-conference team Tuesday with Clemson having eight players among the selections. On offense, left tackle Mitch Hyatt received more votes than anyone else in the conference with 130. He was joined by wide receiver Hunter Renfrow and center Justin Falcinelli. On defense, Clemson's entire line made the list. Clelin Ferrell and Christian Wilkins received 122 votes each, Dexter Lawrence received 119 and Austin Bryant received 80. Linebacker Kendall Joseph also made the list for Clemson. Wilkins was also second in preseason Player of the Year voting with 42 votes. Boston College running back A.J Dillon edged him out with 45.